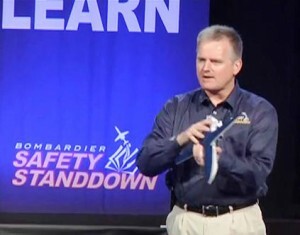 This presentation delivered at the Bombardier Safety Standdown 2015 begins with an update on the rapid progression of industry initiatives and regulatory advancements being implemented to reduce the risk of loss of control in-flight. Then, the influence of hazardous mental attitudes are addressed with respect to airplane state awareness during routine flight operations leading to unintended consequences. Distraction management integrated with enhanced flight path awareness keeps pilots and crews focused on what matters when it matters most. Complacency in combination with decreased attitude, airplane state and flight envelope awareness can quickly place pilots in unfamiliar territory. Regaining situational awareness, positive flight path control and task prioritization can be learned systematically even in a time-critical life-threatening crisis. at the Safety Standdown website. The statement ‘first indication of stall’ when discussing the flight testing of Part 25 airplanes is referencing the first indication of the ‘full stall’ per AC 25-7C, not the stick shaker or other ‘pre-stall’ stall warning device. Pick your sector below to find out how our training can be applied to your specific industry needs.